I've been attempting to incorporate more fruit into my meals. We are great at having lots of vegetables, but not so great at eating fruit. Weird right? I know. I only have one child who actually loves fruit. The other two would rather go hungry than eat a banana or an orange for a snack. 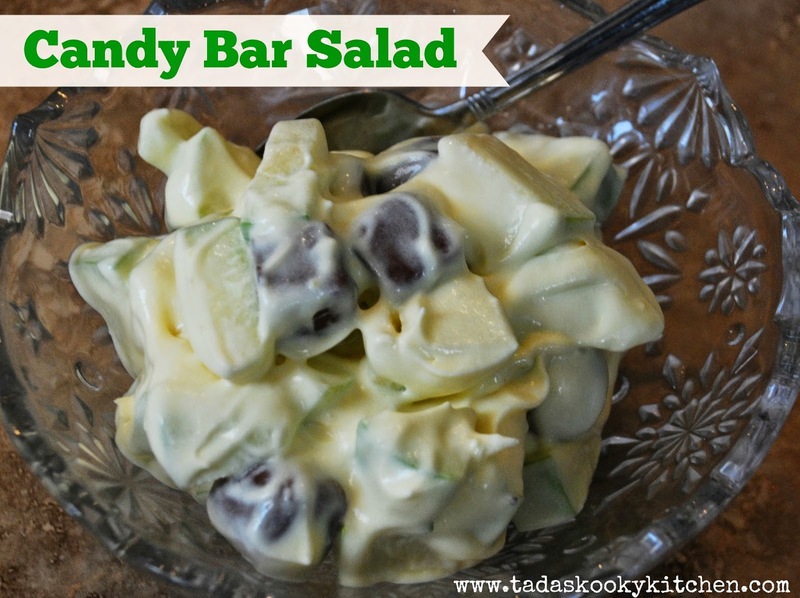 While searching through my cookbooks the other day I ran across a recipe for a version of Candy Bar Salad. It had a bunch of stuff in it, stuff that there is no way my kids would eat all mixed up together. But I figured if I omitted a couple of things and adjusted the recipe they might be willing to try it. Bingo!! They loved it. Wash, core, and cut apples into bite size pieces. Mix milk and pudding and directed on the package of pudding. Then mix everything together in a big bowl. Serve. Simple right? Everyone loved this salad. It was super easy to put together and it didn't last long.